It is that time of year that I start thinking of ways to use pumpkin. So you might see quite a few recipes using pumpkin in the near future. 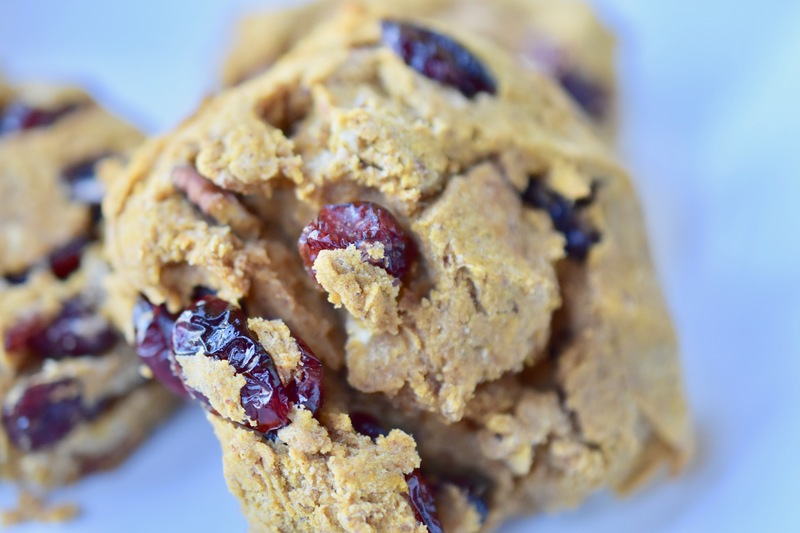 This recipe is an adaptation from my original Pumpkin-Cranberry Cookies. This particular recipe uses a fruit paste for part of the sweetener. I like these cookies because they are not overly sweet, just the right amount of sweetness. These cookies are – Oh So Delicious. Preheat oven to 350 degrees. Line baking sheets with parchment paper/silicone mat. Mix together wet ingredients in a large bowl. Set aside. In a separate bowl mix together dry ingredients: GF All-Purpose Flour Blend, baking powder, salt, Baking Spice Blend, cranberries and pecans. Mix the dry ingredients into the pumpkin mixture. Stir until well combined. I used an ice cream scoop so the cookies are a substantial size. That is just the way I like my cookies. Bake 12-13 minutes. Let cool for at least 5-10 minutes. Note: This recipe makes 15 large cookies. Also, these cookies do not spread.